Gene St. Denis of Blue Ribbon Charters and Tahoe Trophy Trout at South Lake Tahoe, Calif. (530-544-6552): Fishing has been good to excellent. We have been trolling 100-200 feet deep. We locate the fish on the fish finder and then troll Dodgers and a live minnow in a "Figure Eight" pattern, bouncing the bottom. 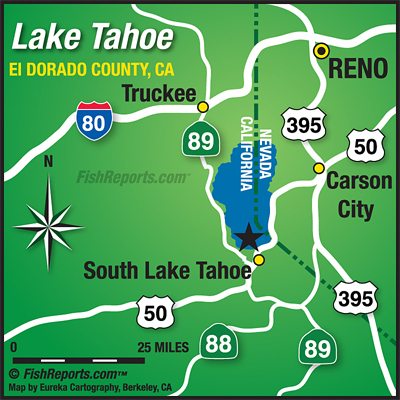 I've been fishing at Cal-Nevada Point, Dollar Point and Sugar Pine Point.